Cell biology or cellular biology (formerly cytology, from the Greek kytos, "container") is an academic discipline that studies cells, including their physiological properties, structure, organelles, environmental interactions, life cycle, division, and death. The object of cell biology, a cell is the structural and functional unit of all living organisms and is sometimes called the "building block of life" (Alberts 2002). Some organisms, such as bacteria, are unicellular, consisting of a single cell. Other organisms, such as humans, are multicellular. Knowing the composition of cells and how cells work is fundamental to all of the biological sciences. Appreciating the similarities and differences between cell types is particularly important to the fields of cell and molecular biology. These fundamental similarities and differences provide a unifying theme, allowing the principles learned from studying one cell type to be extrapolated and generalized to other cell types. Despite the diversity of living organisms (prokaryotic bacteria to elephant) and the diversity of cells (protozoa, human brain cell, ostrich egg, plant cell), cell biology has elucidated common principles that cells share. These similarities are numerous and fundamental. All cells share a common carbon-based biochemistry. All cells pass on their heredity via the genetic material that is based upon nucleic acids such as DNA using a nearly universal genetic code. Every cell, no matter how simple or complex, utilizes nucleic acids in manufacturing proteins. All cells utilize energy for maintenance, growth, and self-repair and use adenosine triphosphate (ATP) as the molecular currency of energy transfer. All cells are differentiated from their environment by a membrane of phospholipids in which are embedded thousands of protein molecules fulfilling the needs of sensory awareness and transport across the membrane. The ubiquity of cells within all living organisms, and the common principles and structures that they share, reveals the unity, harmony, and connectedness of nature. 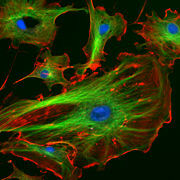 Cell biology looks for the common principles that cells share and how cells carry out their diverse functions. Cell biology is done both on a microscopic and molecular level, and extends to both single-celled organisms and the many specialized cells in multicellular organisms. Research in cell biology is closely related to genetics, biochemistry, molecular biology, and developmental biology. Cells were discovered in the middle of the seventeenth century. Robert Hooke, an Englishman, discovered cells in cork using an early microscope, and in 1665 he published a book entitled Micrographia with his observations. Hooke coined the biological term cell because his observations of plant cells reminded him of monks' cells which were called "cellula." 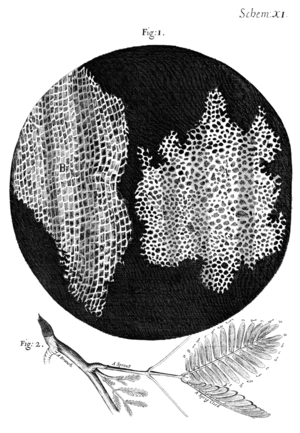 He is often credited with the discovery of the cell, and although his microscope was very basic, research by British scientist Brian J. Ford has now shown that Hooke could have observed cork cells with it. Over time, biologists discovered cells in a wide variety of plants and animals, as well as microorganisms, and identified key parts, such as the cell nucleus. The cell doctrine arose in the 1830s and held that plants and animals are made up of cells and that cells are the common unit of structure. This major tenet of cell biology was first developed in 1839 by Matthias Jakob Schleiden and Theodor Schwann. 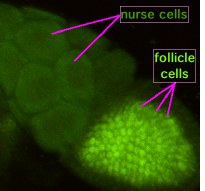 Later in the century, Rudolph Virchow stated that cells always emerge from cell divisions (omnis cellula ex cellula) establishing a second fundamental tenet of cell biology that cells arise from preexisting cells by cell division. Chromosomes were first observed in plant cells by Swiss botanist Karl Wilhelm von Nägeli in 1842, and independently in Ascaris worms by Belgian scientist Edouard Van Beneden (1846-1910). Chromosome behavior in animal (salamander) cells was later described in detail by German anatomist Walther Flemming, the discoverer of mitosis, in 1882. In 1953, on February 28, Watson and Crick made their first announcement on the double-helix structure of DNA. In 1981, Lynn Margulis published Symbiosis in Cell Evolution detailing the endosymbiotic theory that some cell organelles (mitochondria and chloroplasts) trace their origins to prokaryote organisms. Cell division (binary fission and mitosis) - The origin of new cells. Another process studied is the movement of proteins. Proteins (red and green stain) at different locations in a cell. Every cell typically contains hundreds of different kinds of macromolecules that function together to generate the behavior of the cell. Each type of protein is usually sent to a particular part of the cell. An important part of cell biology is investigation of molecular mechanisms by which proteins are moved to different places inside cells or secreted from cells. Most proteins are synthesized by ribosomes in the cytoplasm. 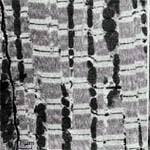 This process is also known as protein biosynthesis or simply protein translation. 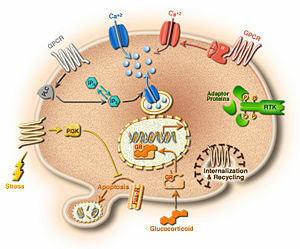 Some proteins, such as those to be incorporated in membranes (membrane proteins), are transported into the endoplasmic reticulum (ER) during synthesis and further processed in the Golgi apparatus. From the Golgi, membrane proteins can move to the plasma membrane, to other subcellular compartments or they can be secreted from the cell. The ER and Golgi can be thought of as the "membrane protein synthesis compartment" and the "membrane protein processing compartment," respectively. There is a semi-constant flux of proteins through these compartments. ER and Golgi-resident proteins associate with other proteins, but remain in their respective compartments. Other proteins "flow" through the ER and Golgi to the plasma membrane. Motor proteins transport membrane protein-containing vesicles along cytoskeletal tracks to distant parts of cells such as axon terminals. Extracellular and cell surface proteins destined to be degraded can move back into intracellular compartments upon being incorporated into endocytosed vesicles. Some of these vesicles fuse with lysosomes where the proteins are broken down to their individual amino acids. The degradation of some membrane proteins begins while still at the cell surface when they are cleaved by secretases. Proteins that function in the cytoplasm are often degraded by proteasomes. Hooke, R. 1665 (1667 printing). Micrographia: Or Some Physiological Descriptions of Minute Bodies Made by Magnifying Glasses With Observations and Inquiries Thereupon... Retrieved December 20, 2007. This page was last modified on 20 January 2017, at 21:23.